This Brake Bracket Shim Kit fits the Coleman Modular spindles. The shims bolt directly to the brake bracket which holds the shims in place when removing the brake bracket. 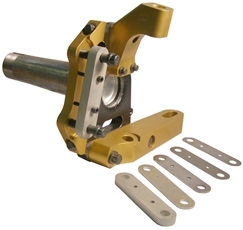 No more hassle trying to install loose shims when removing and installing the caliper. Must be used with new style Coleman caliper brackets part no. 22608 drilled and tapped for shims. Old style caliper brackets can be used but must be drilled and tapped to accept the shims. Kit includes: 1) .017 Shim, 1) .035 Shim, 1) .089 Shim, 2) .125 Shims, 1) .375 Shim, 1) .500 Shim. Note: Caliper bracket sold separately.